Since my daughter has become a preschooler, I have been keeping one eye out for coordinating mother/daughter bags that would please both of us. We actually have about 3 sets of coordinating bags, but we don't use them. One set is custom handmade tote-style handbags, another is matching monogrammed Lands' End totes, and she does have a mini Vera Bradley bag in Raspberry Fizz that is made in the same fabric as my Vera Bradley messenger bag. 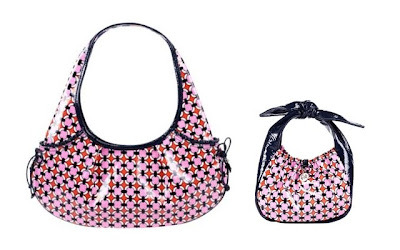 Since the Vera Bradley Frill Collection came out, I have been eying these bags as possible mother/daughter bags. These bags are clearly designed for people with youthful taste, so even though I found quite a few prints that my little girl would love, I did not have quite as much luck for myself. 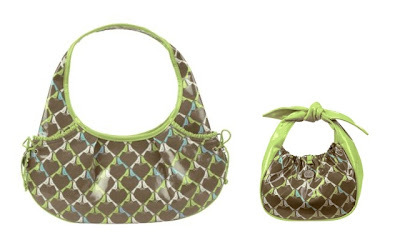 Then I came across the Vera Bradley Tied Together Hobo and the Tippy Tie bags in the Sittin' in a Tree print (pictured above). This color combination in this print is one I could see myself using this spring. Well, my daughter did not like it at all. Instead she fell in love with the Loves Me print (pictured below), but I just do not think I can carry a bag in that print. So, what would you do? Would you buy a purse you did not like for yourself because your daughter has her heart set on the matching one?